Please welcome Kita from Pass the Sushi! Her blog is a great mix of savory and sweet recipes, and she does a ton of great grilling posts. 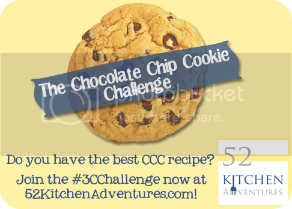 She brings us the final guest post in the Chocolate Chip Cookie Challenge, so I hope you’re getting your posts ready for the link-up on August 15th! When asked what my favorite chocolate chip cookie recipe was for the chocolate chip cookies challenge, my father’s classic chocolate chip cookie came to mind. It’s the same recipe you will find on the back of the Nestle chocolate chip bag, but something about when my father makes them transforms them into the most amazing cookies in the world. Along came the day when I needed to find my own chocolate chip cookie. Now, I’d like to believe myself a cookie conosuer, as I have never turned down the chance to taste test a new flavor. Most of which I have liked, but these white chocolate cranberry cookies really jumped out at me. Something about the tart cranberries colliding with the sweet bits of white chocolate make these light cookies my go to recipe. I have made batches of these for fundraisers, to impress my not-yet boyfriend, his parents, my parents, and more. Seriously, if these are good enough for ‘his’ parents, you know they are good! Gorgeous photos. The cookies sound delish! @the wicked noodle – Kita is a great photographer! I always love her photos too. This is oozing with flavor love it! I love how thick these cookies are, and the colors are just beautiful! @Laura – me too! Kita did an awesome job with the cookies and the photography.